Blowout Sale! 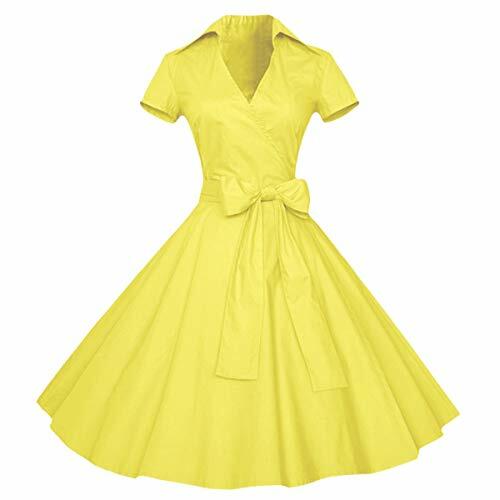 Save 57% on the Samtree Womens Polka Dot Dresses,50s Style Short Sleeves Rockabilly Vintage Dress(M(US 4-6),Yellow) by Samtree at Femi Store. MPN: AM0373-10-M. Hurry! Limited time offer. Offer valid only while supplies last. 1950s Vintage Style Rockability Polka Dot Dress for women girls,make from stretch cotton blend,short sleeve with belt, good for daily wear or work. 1950s Vintage Style Rockability Polka Dot Dress for women girls,make from stretch cotton blend,short sleeve with belt, good for daily wear or work. The tag on the dress is Asia size,please follow the size details on the image, not the size chart link from Amazon system. Short sleeve & lapel V neck,1950s style wrap look,pleated back design,if you don't like a loose back,after ironing and put on the belt,it will much better,and high waist with belt can adjust waistline. 50 style swing rockailly dresses perfect to wear with Tutu Underskirts,it's great for daily casual, ball,tea party, banquet, work and other occasion. Take Care: The tag on the dress is Asia size,please follow the size details on the image, not the size chart link from Amazon system. If you have any questions about this product by Samtree, contact us by completing and submitting the form below. If you are looking for a specif part number, please include it with your message.